Spiders are scary to humans, but even scarier to ants. They prey on ants constantly! However, even spiders have many fears too, as they are the favorite meal of many other creatures. Spiders have figured out a way to not only have an endless supply of ants to eat, but to even trick their prey into defending them and keeping them safe from predators. Because ants live in such large groups, and are very territorial, they are often left unbothered by many predators a spider would have to deal with. This, along with the fact that ants are a delicious meal for spiders, gives the spider a very good reason to want to live with them. 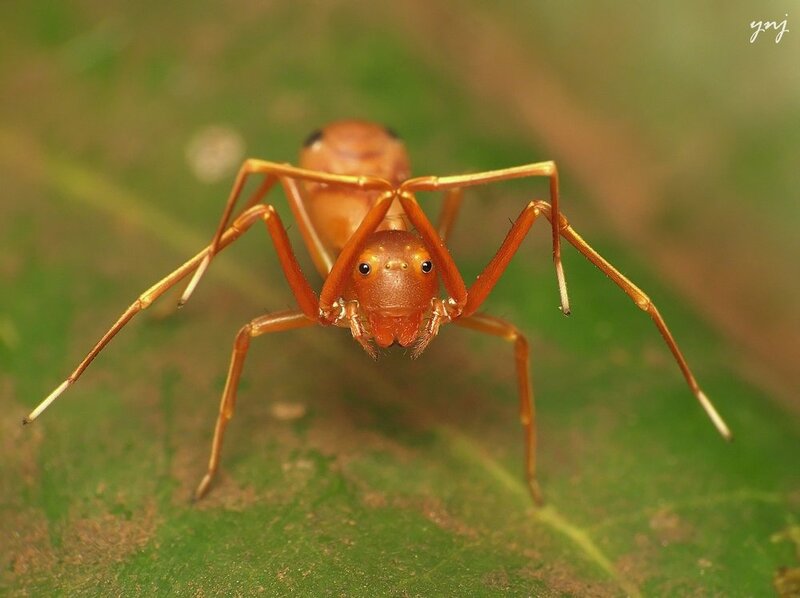 In a phenomenon called myrmecomorphy, spiders are able to change the way they look and act, and trick the ants into thinking that they are one of them. Most of these spiders that trick the ants are covered in reflective hairs that simulate the shiny, three segmented body of an ant. They also have color patches around their eyes to make it look more like an ants eye. They even act like ants! They take their front to legs, and hold them up near their heads to make them look like antennae. They'll even learn to walk in a very erratic, zig-zag pattern just like ants do. Spiders deserve a lot of credit for being able to pull this off. Not only are they able to change how they act and look, but they are also even able to perform some of the most stealthy eating and killing of any insect. Many times, they will wait until they find themselves alone with an unsuspecting ant, thinking that the spider is actually one of its own. When the spider sees that the time is right, and none of the other ants will notice, he pounces and kills his prey! Leaving no witnesses and no one suspicious at all. After killing his mea though, he still needs to eat it. The spider, still mimicking the ants, will perform something that is quite normal for the ant tribe. He will carry off the dead nest-mate away from their nest, which is a very common practice, thus bringing about no suspicion at all. Once the spider has taken away his meal, he is finally able to eat it. After this he will continue to fit into the group of ants, being protected and treated like one of their own, until he finds another opportunity to strike and get his next meal.